I found this excellent new game. You open all 13 of these drawers and empty out all the stuff into one pile and then you wait for mummy to put everything back before you do it again... 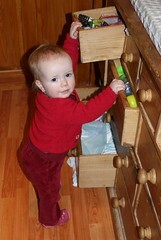 Sometimes you can even jam the living room door closed with the nappies in the bottom drawer.